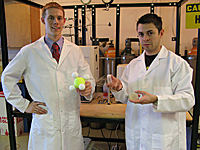 Because of their unique ability to translate complex science into something understandable and fun in the classroom for various age groups, University of Wyoming graduate students David Herr and Tommy Servantez are heading to the nation's capital. The two will present their poster abstracts at the National Science Foundation (NSF) Graduate STEM (Science, Technology, Engineering and Mathematics) Fellows in K-12 Education Conference March 17-18, in Washington, D.C.
"From what I've been told, there were 125 submittals and 32 abstracts were selected," says Servantez, who majors in chemical engineering. "This just kind of reinforces the fact that our program is reaching the middle school and high schools levels like it's supposed to, and getting kids excited about science." Other than UW, Penn State University was the only other institution that had two students selected to present poster abstracts, says Sonia Ortega, NSF's Graduate School of Education program director. "We usually only have one representative per university, but we ended up selecting a couple from your institution," Ortega says. "There are several things we take into account when making our selections. It has to be good science. It has to be written in a way that is not only understandable to scientists, but to the public as well. And it has to be interesting science." "Wyoming having two of these awards is significant for one university," says Don Roth, deputy director for academics in UW's School of Energy Resources (SER) and director of the Science Posse Fellows group on campus. "It's an example of how the university is addressing K-12 STEM needs in the state and contributing to the needs of graduate students through experience in the classroom and preparing them for positions in the future." Through the GK-12 program, institutions of higher education have an opportunity to make a significant change in STEM graduate and K-12 education programs by creating strong and enduring partnerships. Since its inception in 1999, the GK-12 Program has funded more than 200 projects in more than 140 different universities throughout the U.S. and Puerto Rico. Managed by NSF's Division of Graduate Education, the Fellows program provides annual funding to graduate students in science, technology, engineering and mathematics (STEM) disciplines. Fellows, who receive an annual stipend of $30,000 as well as have their tuition and fees covered, acquire additional skills that will broadly prepare them for professional and scientific careers in the 21st century. To be considered, Fellows must describe their STEM research as well as how they integrate aspects of their research into K-12 classrooms, schools or out-of-school settings. Typically, only 25-30 Fellows (32 this year) are chosen annually to present abstracts. A committee of program staff from NSF and the American Association for the Advancement of Science (AAAS) makes the selections. Servantez's abstract is titled "Modification of Recombinant Spider Silk for Tissue Engineering Scaffolds." This is his second year as an NSF STEM Fellow and first as an abstract presenter at the conference. "My research is using recombinant spider-silk proteins to generate tissue engineering scaffolds. The silk protein is created in E. coli," says Servantez, of Lingle, and a member of the Science Posse group on campus. "To demonstrate genetic engineering with kids, I help them transform E. coli with a green fluorescent protein from jelly fish. They can see it glow in the dark." Servantez has presented his research at South High School in Cheyenne, as well as Snowy Range Academy in Laramie and at a camp sponsored by UW's School of Energy Resources (SER). For Herr, whose hometown is Cheyenne and who is a member of the Energy and Environmental (EE) Nanotechnology group (headed by Maohong Fan, associate professor of chemical and petroleum engineering) on campus, this will be his second consecutive year both as a Fellow and as a presenter. Herr's poster abstract is titled "Catalytic Effect of Sodium Carbonate on Char-based CO Production." His abstract studies sodium carbonate catalysts supported by a high-surface area of coal or biochar (biomass charcoal derived from plant biomass materials) that are being studied independently in a plug-flow reactor under different conditions. The purpose of his study is to convert CO2 to a useful gas, CO, for energy production or organic chemical synthesis. "It feels pretty good. It's really unique to be selected twice," says Herr, who is majoring in chemical and petroleum engineering. "The main idea of this poster is to show how I use education in the classroom." To demonstrate his study to students, he attaches ping-pong balls to a tennis ball to show how adding smaller particles to larger ones increases the surface area-to-volume-ratio. "I show them how much ash is put into the atmosphere by a coal-fired plant," Herr says. "Even when you have the best emission controls available in place, it still shows how many emissions are put into the atmosphere." Herr has taught at Lander Valley High School, Douglas High School and Niobrara County High School in Lusk. Through his Fellowship, Herr says "I have learned, through coming into the classroom, how to present information to a wide range of audiences so that almost anyone can understand the technology." "When you submit an abstract, you're supposed to explain how you bring your work and tone it down to an age-appropriate level," he says.